We’ve had a great deal of rain here in the Texas Hill Country – and we needed it. While there have been a few days where I would’ve liked some clear skies, I’ve truly enjoyed the rain otherwise. 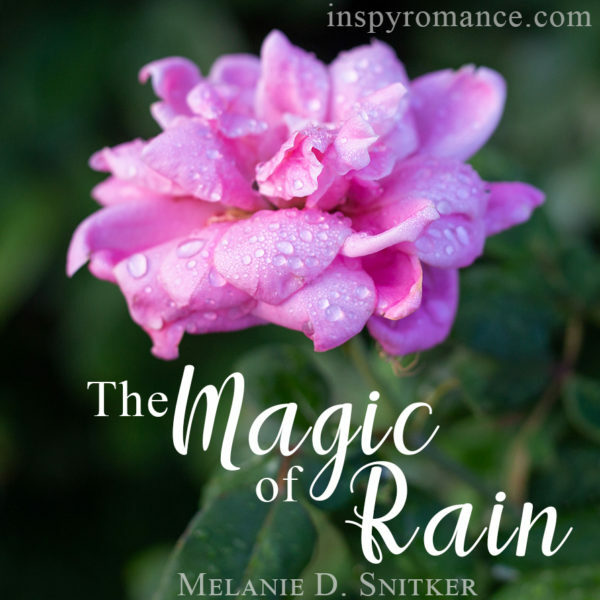 There are a lot of things that rain makes me think of: Like wearing warm sweaters on a cool day, watching rivulets of water stream down the window pane, or a sipping warm mug of hot chocolate with marshmallows melting on top. It’s more than that, though. There’s just something about it that makes the world new. Clean. Fresh. I enjoy seeing which plants spring to life after a good rain. Often, they are plants that I’ve thought long dead, or even some I never knew existed until then. This always reminds me that there’s more to life than what we can see, and that there’s beauty all around us in some of the most unexpected places. Everything seems clean. I’m not just talking about my car, although that part is certainly true as well. I’m more referring to the way the air smells and how bright the green grass looks with drops of rain sprinkled in for good measure. 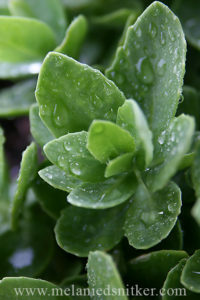 Rain also makes everything fresh. As though there are new possibilities around every corner. It reminds me that no matter how dry or desolate things may look one day, all it takes is a thorough rain to change it all. I like to think that applies to my life and the way that God can use every day things to renew my faith in mankind. In the future. In myself. How about you? Do you like the rain? What does it make you think of? Answer below, and one person who comments will win a $5.00 Amazon gift card. I’ll keep this giveaway open through the week and choose a winner on Saturday. The winner will be contacted by e-mail. I look forward to reading your responses. God bless! Police Officer Tuck Chandler is good at his job. He’s also good at holding women at arm’s length. Jilted by his fiancée for his dedication to his job, he’s not about to open himself up to hurt like that again. Laurie Blake is a struggling photographer. After growing up in a wealthy family, she’s determined to make it on her own, even if it means doing it the hard way. When Tuck is assigned to a puzzling burglary involving Laurie’s fledgling photography business, he goes into it with his usual perseverance. He wants to help her – if she’ll let him. As the case unfolds and the mystery deepens, another question arises. Will the past get in the way of their future? I love rain when it’s warmer waether. When it’s cold, not so much. It reminds me of cleaning out the negativity. Thanks for the post. That’s so true about rain when it’s cold. Then it’s hard to get warmed up again! Hi Melanie. I love rain- unfortunately, a large part of Australia is in drought and the lack of rain is causing serious heartache for many outback. Makes me very grateful for the drizzly rain we had on Sunday. Rain always makes me think of renewal- of being washed clean and restored. Hi Wemble! Oh, that’s terrible that the drought has gotten so bad there. :-( I hope that breaks soon and the area gets some much-needed rain. Hi Melanie! This year has been an unusually wet spring and summer in Michigan, which we gauge by the water depth of Lake Michigan. This year ocean vessels have no problem accessing our port in SW Michigan. I enjoy gentle summer rains which remind me of renewal, cleansing and restoration, not torrential downpours with flooding which is the opposite – destruction and churning brown dirty waters, washed out farmers’ crops. As in life, even rain has two sides. Unfortunately this year SW Michigan has seen both. Personally in my lifetime 65+ years, I never remember so much flooding and such deluges of rain – 6+ inches in just a few hours. Living close to a body of water we often have 30 days of gloomy weather, especially in winter. Fall is in the air with cooler temperatures. Enjoy the rain. Best wishes and Happy Writing. You are very right, even rain has a good and a bad side to it. Wow, 6+ inches of rain in just a few hours will cause a lot of damage. I love the rain. It is so calming. I remember when I lived in Guyana and it would hit our shingles roof. It was one of the best sounds. Rain allows me to rest at home. It calls me to pick up a book and have a cup of tea and enjoy the moment. When I am outside I love to take pictures with rain drops on them. All of that makes me wish it were raining again today. Although we’re supposed to get more again starting tonight. Yes, nothing encourages reading and relaxation like being stuck indoors while it’s raining! Love the rain though we haven’t gotten much and very much needed. I love walking in the rain so refreshing. I hope you’ll get some much-needed rain soon! I love the smell of rain. Since I live in the south – humid Central Arkansas – I always hope the rain is bringing cooler weather. But it often just makes things steamy. The humidity is finally starting to ebb here though and we’re easing into the cooler temps of fall – my favorite season. That’s usually what happens around here, too. It just makes things humid and steamy. But this last rain cooled things down nicely, and we enjoyed it! Hooray for fall weather arriving there! I love rain. It always makes me think of God cleansing my soul. I adore the rain….except it makes my joints and back hurt now that I am getting old and arthritic….but I still love listening to it! Oh, I’m sorry to hear that the rain makes your joints and back hurt. That’s not good. You’re right, though, listening to rain is the best! I like the smell of rain too, especially when it’s been dry and the rain is welcome. Here in my part of Kentucky, we’ve had several days of rain and I’m more than ready for a little bit of sunshine. I think we’re expecting another inch or so this afternoon so maybe tomorrow the sun will come back for a visit. 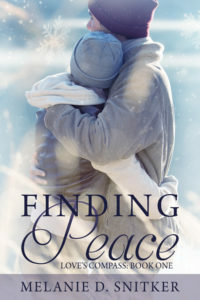 BTW, I enjoyed Finding Peace so I encourage those who haven’t read it to give it a go. I hope that you do get some sunshine tomorrow to help dry things out a little bit. I love sunshine after a rainy day! I used to love rainy days, until we had major roof issues and then I’d started panicking every time it rains. My heart still beat faster after we fixed the issue (it took almost six months for our supper to take action) even though cognitively I knew we had taken precautions around the place. Then we moved, and guess what? More rain.. it is our own place although it’s renovated– should that means we fixed the issues? Probably, but not the case. We arrived home one day after church to find water dripping every where and it just got worse after that… We’ve tried to fix it twice, but apparently the rain is outsmarting us. So now I’m bracing myself for a summer season full of hot humid weather with lots of rain (thanks to El Niño gracing us with his presence in South America… for North Americans living in the West Coast, this is basically the opposite of the effects of El Niña, which should also reach you this winter with freezing temperatures in the Pacific.). Thanks so much, Priscila! I’m glad you enjoyed their story – thank you for reading it! Oh, roof issues would definitely cause panic when you hear the rain. It sounds like getting it fixed was quite the nightmare. Then to have similar issues at your new place. Wow. Here’s hoping you have fewer issues with it soon and the rain manages to stay OUT of your house! I couldn’t agree with you more about the rain in Oregon. I lived in Oregon for a good chunk of my childhood until my husband and I got married. Although it did prepare me for rain anywhere else – it never bothers me. LOL I do hope you’ll get some more rain there in California again soon! Rainy days can be too hot and humid in GA! We had too much rain first few months of this year and hard for us older ones to get out and do what we had to do! But I tried to not complain…just stayed in more and READ! lol Now we actually need rain so….that’s life! I am a pluviophile!! I adore rain and cloudy days. They energize me and make me very happy. It’s been a wet summer and early autumn here. Still, grateful for the rain since we can’t live without it. So very true! Enjoy the cooler temps. I like the rain except when it does it for days on end and causes flooding. Yes, then it’s time for a break. The flooding is never good. I love the rain too! A cool day with soft falling rain, a blanket and a good book makes me feel peaceful and close to God. Hi Sabrina! Thanks for responding! I enjoy going to sleep at night with the rain drumming on the roof. This has been a wet year here in Florida. Since June 1st until now, we’ve had 70″ of rain. Rain makes me think of Jesus washing away our sins. We’re dealing with cold rain here in New England. But at least it’s not flooding. We need rain for the grass and plants to grow, but it’s a pain to drive in especially when others are driving too fast and causing accidents and traffic backup. I’m glad you’re not having to deal with flooding. It is amazing how much rain can effect the drive, though. It doubles my husband’s commute! I love the smell of rain. I think rain is refreshing and soothing. It makes me want to wear comfy clothes, curl up on the couch with a fuzzy blanket and drink tea while reading a good book. I couldn’t agree more, Chanel! I hope you end up getting some soon, Natalya. Thank you! So many fires… Pray for the families! I’m not a huge fan of rainy weather, but do love to see everything pretty and green a few days after a nice rain! I love listening to the rain hit the roof! I love the cooler weather and changing of the leaves in the fall! and I love listening to the rain !